Serbian parliamentary elections 2016 are finally over. As a consequence of many irregularities, after the voting was repeated at 15 different polling stations, and a full week after the legal deadline, the final results came in. The Serbian Progressive Party of the Prime Minister Aleksandar Vucic claimed more than 48% of the vote and more than 50% of the seats in the parliament. But the real news came from the nationalist part of the political spectrum, where the Serbian patriotic and Eurosceptic (in fact anti-EU), pro-Russian list of DSS-Dveri (Democratic Party of Serbia and the Dveri movement) managed to pass the 5% threshold by winning a staggering 25% of the vote on the repeated polls, coming second in line only to the ruling Serbian Progressive Party. This, however, was not the result of the DSS-Dveri coalition alone, but came as a consequence of the support received by the parties of the pro-European liberal block. The entire opposition, except for the Serbian Radical Party, aligned with the coalition of the right in order to prevent a repeat of what had been perceived as an election fraud. After the preliminary count came in, the DSS-Dveri coalition failed to pass the threshold by the margin of a single vote (or 0.75% of a single vote, to be more precise). In an atmosphere plagued by numerous complaints of manipulations and election fraud, it was enough to unite the liberals with the nationalists in order to achieve the closest thing possible to a fair and democratic election. On the other hand, this ad hoc, temporary, technical coalition was enough to start a true avalanche of different predictions, analyses, and warnings regarding the possibility of a color revolution enveloping in Serbia. Among the array of different arguments raised for this purpose, some of which are more valid than others, a clear misunderstanding of the Serbian political scene can be seen. The purpose of this article is to articulate the reasons for which a color revolution cannot happen in Serbia, at least not in the foreseeable future and why the present nationalist/rightist options are unlikely to take part in any sort of the event. 1. The current post-election crisis was generated internally, primarily by the inability of the National election committee (RIK) to deliver accurate and timely results. As for the foreign factor, it was unanimous in acknowledging the elections as fair and democratic, with many statements of congratulation to the Serbian PM Aleksandar Vucic coming from top Western leaders and prominent political figures. Complaints about the results were, on the other hand, first and foremost lodged by the patriotic pro-Russian side of DSS-Dveri. After numerous counts and recounts, this coalition was dragged to a single vote below the 5% threshold, a result so far unique in history. The three liberal parties that managed to enter the parliament (one of them narrowly, by a margin of 800 votes) sided with the nationalists in order to prevent the alleged fraud from achieving its primary goal – giving the ruling party additional parliament seats at the expense of the opposition. It was the only normal and natural thing to do, with no foreign embassies needed to entice such a move. In fact, after it became clear that all three pro-Western options achieved parliamentary status, the American ambassador suddenly lost all interest in the electoral process, and many congratulations towards the ruling Progressives ensued. 2. There is no large-scale, long term-cooperation between the liberals and the patriots. The short term alliance made to ensure fair results, with the DSS-Dveri coalition entering the parliament, has already come to an end. It was all but announced as such on the final post-election press conference held in the party headquarters. And not only that – when one looks at the position that the Western NGO sector in Serbia (one of the most hypertrophied meta-political organisms in this part of the world) took towards the notion of the leftist parties helping a traditionalist coalition of the right enter the parliament, it is clear that the West had no real intention to do so. The move was condemned by many leading NGOs with the rest remaining silent at best. It is hard to imagine a color revolution developing without the support of the international NGOs and their main Western benefactors. It is even harder to imagine such a revolution in a country where the government enjoys a great amount of support from those very same organizations. This brings us to another main point. 3. The color revolution has already happened in Serbia, which was the country which practically developed the idea and its main mechanisms. And it did not occur once, but at least three times, or in three different phases. The first phase came with the coup of October 5, 2000, when Milosevic was ousted in favor of a more democratic and eventually more westernized style of government. This, however, was not enough to achieve all the goals that the US and its allies had in mind. The government of Vojislav Kostunica (the founder of the DSS and its president from 1992 to 2014) ferociously fought for the legal status of Serbian Kosovo, and, therefore, he had to be disposed of. This was done through a second color revolution-like event in 2008, when formerly hardline anti-Western factors such as the SPS (the Socialist Party of Serbia, party of the late Yugoslav president Slobodan Milosevic) and the SRS (the Serbian Radical Party) were infiltrated and taken on a pro-western course, leaving Kostunica alone in his national struggle. The SPS formed a government with the liberal Democrats, while the SRS was split in two, with more than 80% of the party and its voters forming a separate Serbian Progressive Party. The third and final phase of the color revolution, one could argue, came in 2012 when the Democrats were disposed of in favor of the reformed radicals. In that way, all of the bad and subversive decisions made from the year 2000 onwards were legitimized by a nominally rightist political force of great influence and popularity among the Serbian patriots. That political force is still in power and there are no real sings of any Western opposition to the fact. Vucic failed to produce any real resistance towards negative foreign influences and in many cases stepped up the faulty policies of previous governments. So far, he has only received praise from those international factors that could be responsible for a Maidan-like event. 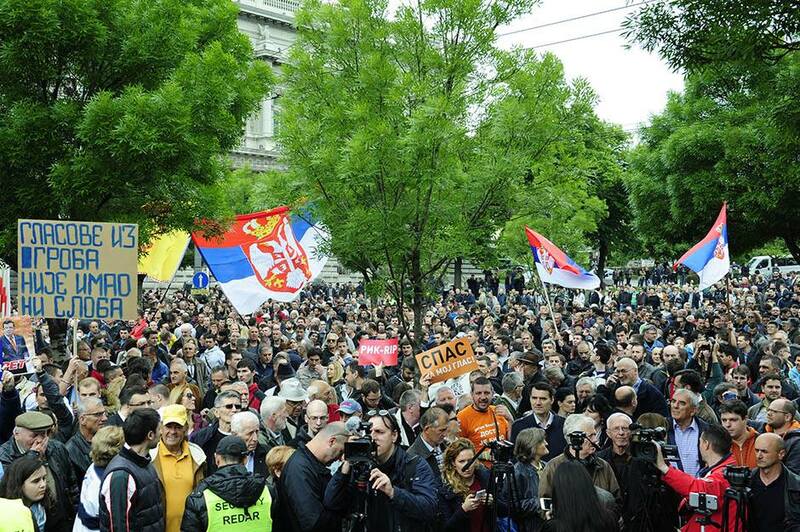 All this, however, does not mean that the color revolution scenario in Serbia will always remain impossible. If anything, it is bound to repeat, or continue its progress, depending upon interpretation. The mark set for its continuation will come the first time when the Serbian government of Vucic’s Progressive Party engages in an actual confrontation with the West. As soon as that happens, the Prime Minister will likely face the same fate as all of his predecessors, from Slobodan Milosevic onward. But, until we see such a development, it is very counterproductive, even dangerous to “cry wolf”, and even more so to condemn and criminalize every healthy patriotic opposition effort to change the present government, or at least alter its political course.